This is a comprehensive review of management options for retinal arterial macroaneurysms (RAMs). Although close observation is typically recommended for RAMs not involving or threatening the macula, other treatment modalities can be considered for exudative or hemorrhagic complications that are vision-threatening. New imaging technologies like optical coherence tomography angiography (OCT-A) have been able to detect RAMs without the need of dye injection, further elucidating our understanding of blood flow within and around them. Observation alone is usually an adequate treatment when a lesion is not threatening the fovea. 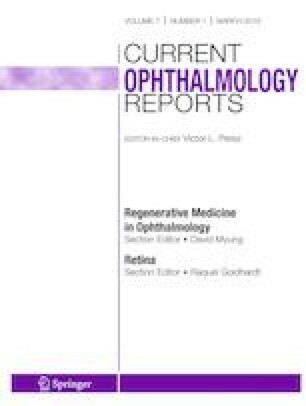 Laser photocoagulation and intravitreal injection of vascular endothelial growth factor (VEGF) inhibitors have effectively been used for management of exudative RAMs, whereas options including injection of VEGF inhibitors, tissue plasminogen activator (tPA), vitrectomy, gas, and yttrium aluminum garnet (YAG) laser have been used for hemorrhagic RAMs. To date, there is no consensus regarding management of symptomatic exudative or hemorrhagic complications of RAM. Additionally, a case report is presented within this paper to illustrate the successful treatment of a hemorrhagic RAM in a symptomatic 65-year-old man using intravitreal bevacizumab. Supported by the NIH Center Core Grant P30EY014801, and Research to Prevent Blindness Unrestricted Grant. Brian Evan Goldhagen reports grants from NIH Center Core Grant P30EY014801 and grants from Research to Prevent Blindness Unrestricted Grant during the conduct of the study. Raquel Goldhardt declares that she has no conflict of interest. Astroz P, Miere A, Cohen SY, Querques G, Souied EH. Optical coherence tomography angiography in the diagnosis and follow-up of retinal arterial macroaneurysms. Retin Cases Brief Rep. 2018. https://doi.org/10.1097/ICB.0000000000000741.